As the increased concern about energy-efficiency and the dangers inherent in pumping hot concentrated sulfuric acid, JH Pumps supplies JHG specialized vertical concentrated sulfuric acid pumps for heat recovery unit in concentrated sulfuric acid plant based on its prior expertise and decades of experience in field. To transfer concentrated sulfuric acid where concentration is up to 98.6% and temperature is up to 220℃ at heat recovery unit of concentrated sulfuric acid plant at low temperatures. ●Support structure at drive side: double-row angular contact ball bearing close to drive side balances axial thrust. 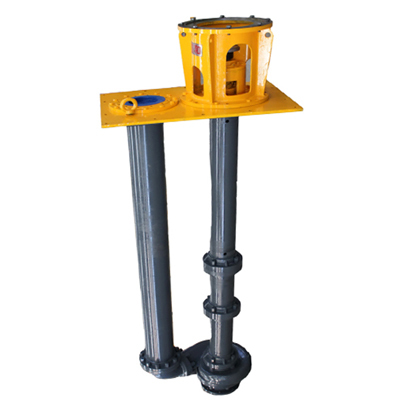 ●Support structure at suction side: one sliding bearing close to suction side withstands radial load. Multiple journal bearings are available if necessary. ● Rolling bearing is lubricated by grease refilled straight through a filling port on bearing housing. ●A specialized new-type mechanical seal assures longer service life due to greater reliability and thermostability. ●The sliding bearing is made of high-chromium-nickel alloy with great thermal expansion resistance, which is lubricated by the fluid handled. It ensures smoother operation and a longer wear life. ●Grid coupling with accurate alignment, vibration absorption and ease of dismantling and assembly.